EUPRERA supports the contributors of the annual congress as well as the members in the publication process. Following the EUPRERA annual congress there are two publishing opportunities for authors who have successfully submitted and presented papers at the congress: the affiliated congress journal and the congress book. Besides, some of the EUPRERA projects have as a result a published book. The Journal of Communication Management (JCom) is the definitive international journal for research-oriented communication managers and professionals as well as for researchers who aim to develop or challenge practice. Articles are closely linked to strategic communication, public relations, organizational communication, corporate communication and related fields. JCom is a formal partner of EUPRERA, and the preferred publishing partner of the Chartered Institute of Public Relations (CIPR). Part of the series Advances in Public Relations and Communication Management (APRCM) published by Emerald, each volume includes contributions from EUPRERA’s annual congress and follow the theme of each event. APRCM publishes research on the planning, implementing, monitoring, and revision of all the channels of communication within an organization. It is an essential publication for communications and public relations professionals in private and public sector organizations as well as academics in universities and business schools. Public Relations and the Power of Creativity (2018), edited by Sarah Bowman, Adrian Crookes, Øyvind Ihlen, Stefania Romenti. Published by Emerald. With the best contributions out of the 2017 EUPRERA congress in London. Ebook also available. How Strategic Communication Shapes Value and Innovation in Society (2017), edited by Betteke van Ruler, Iekje Smit, Øyvind Ihlen, Stefania Romenti. Published by Emerald. With the best contributions out of the 2016 EUPRERA congress in Groningen. Ebook also available. 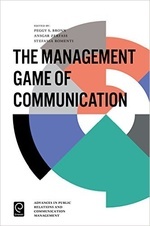 The Managment Game of Communication (2016), edited by Peggy S. Bronn, Ansgar Zerfass, Stefania Romenti. Published by Emerald. With the best contributions out of the 2015 EUPRERA congress in Oslo. Ebook also available. Comunication Ethics in a Connected World. 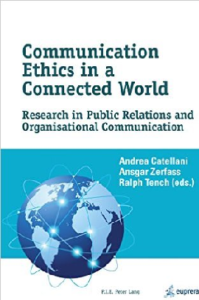 Research in Public Relations and Organisational Communication (2015), edited by Andrea Catellani, Ansgar Zerfass, Ralph Tench. Published by Peter Lang. With th e best contributions out of the 2014 EUPRERA congress in Brussels. Ebook also available. 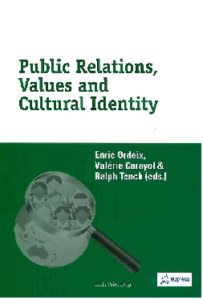 Public Relations, Values and Cultural Identity (2015), edited by Enric Ordeix, Valérie Carayol, Ralph Tench. Published by Peter Lang. With the best contributions out of the 2013 EUPRERA congress in Barcelona. Ebook also available. 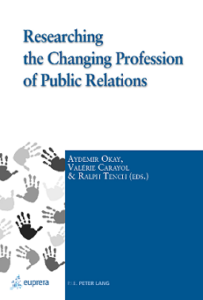 Researching the Changing Profession of Public Relations (2013), edited by Aydemir Okay, Valérie Carayol, Ralph Tench. Published by Peter Lang. With the best contributions out of the 2012 EUPRERA congress in Istanbul. Ebook also available. Communication Excellence. How to Develop, Manage and Lead Exceptional Communications (2017). Edited by Tench R., Vercic D., Zerfass A., Moreno A., Verhoeven P.
The study behind this book, the European Communication Monitor, is known as the most comprehensive provider of reliable data in the communication field worldwide.